The visit of Comet Halley in 1987 sparked a wide range of scientific interest and a slew of space probes went to visit it. The Giotto probe was one of the most successful ones during this period and it certainly left scientists with much to study but also many unanswered questions. A follow-up mission to a comet was very much desired, and it was with this mindset that Rosetta was created. Over a span of a decade, it traveled in the silence of space awaiting its goal: gaining an advantage over Giotto by landing a probe on the surface of a comet. Rosetta is 2.8 x 2.1 x 2 meters in dimensions with 2 solar panels that are 14 meters long each with an individual surface area of 64 square meters. Each can power at 850 watts from a distance of 3.4 AU and up to 395 watts at 5.25 AU. Rosetta also has two axis-steerable high-gain antennas allowing for degrees of motion; both antennas are 2.2 meters in diameter (Heinemann). 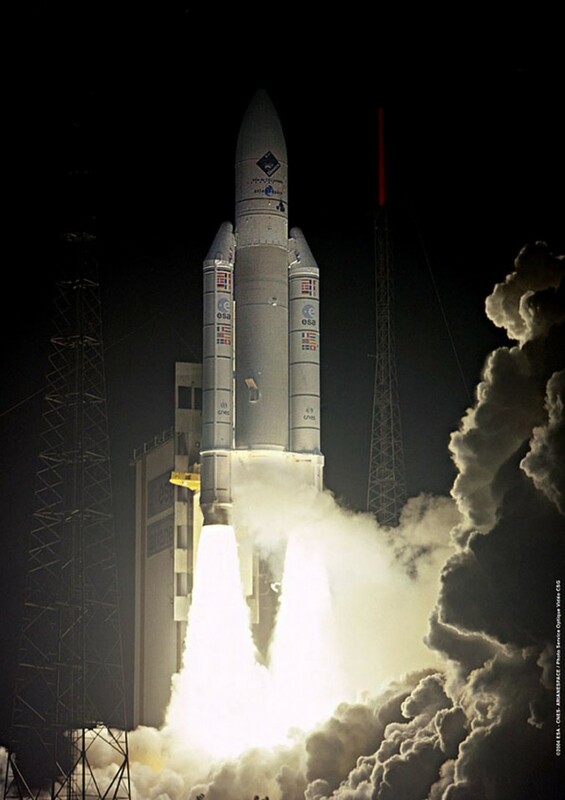 The original launch of Rosetta was set for 2003, over 10 years after the ESA approved the mission. The target was 46P/Wirtanen, but rocket problems caused the launch to be cancelled. Instead, the back-up launch to 67P/Churyumov-Gerasimenko occurred on March 2, 2004 aboard an Ariane 5 G rocket from Kourou, French Guiana. Comet 67P/Churyumov-Gerasimenko was discovered by its namesakes in 1969 and first imaged directly by Hubble on March 12, 2003. With a nucleus diameter of 4 kilometers and an orbital period of 6.45 years, 67P has a perihelion of 1.24 AU and an aphelion of 5.68 AU. This is rather standard for a comet for it implies a highly elliptical orbit (in fact, an eccentricity of 0.64) (Heinemann). Upon completion of these flybys, Rosetta entered hibernation on June 8, 2011 and would not exit it until January 20, 2014 (Ibid). Finally, after traveling through the cold darkness of space for 10 years, Rosetta arrived at 67P on August 6, 2014 and entered a 100 kilometer altitude orbit. Almost immediately, images began to pour in that hinted at exciting features. “Parallel linear features” that looked similar to cliffs were seen and possible boulders that had slid down a smooth face. 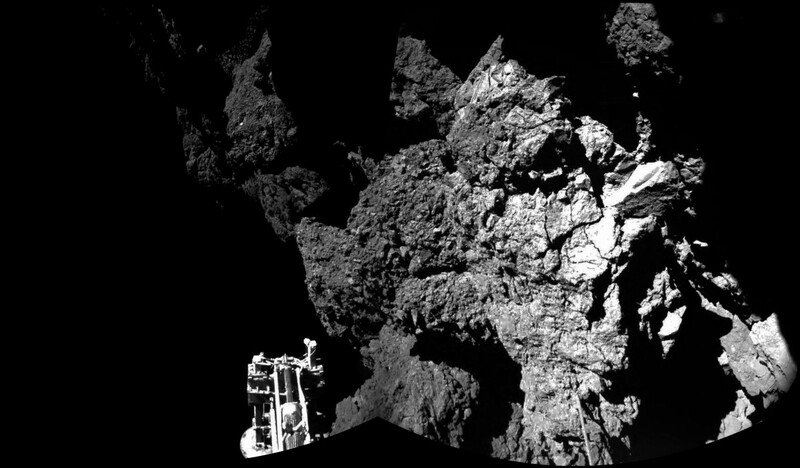 Finding these was important, for Philae needed a nice spot to land and avoid any complications. Also something to be considered was the orbital axis of 67P. Unlike a planet (which spins perpendicular to the plane of the solar system), the comet instead spins on a slant. This means that some parts of the comet remain in shadow for extended periods and therefore would inhibit Philae’s ability to recharge its batteries (NASA “As Seen,” Max Planck “Rosetta: the Dark Side”). All the preparations were made and an ideal landing site was found. Finally, on November 12, 2014, Philae separated from mothership Rosetta and made her 7-hour slow descent to the surface of 67P. All looked great as the probe got lower and lower and after a few hours it transmitted telemetry that indicated touchdown was successful. But all was not successful as it turns out. For one, the magnetic sensor (which found no external field in 67P) indicated that after Philae touched down, it bounced off the surface at 3 centimeters a second and made second contact almost 2 hours later, then bounced again after traveling a kilometer from its original landing site with a final touchdown 8 minutes later. For some reason, a thruster on top of Philae which was supposed to counteract the recoil of the harpoons (which were to secure Philae to the surface because of the low surface gravity) failed to deploy upon contact. This meant that Philae landed in a position (known as Agilkia) at an angle, on two feet with limited access to sunlight, in the shadow of the larger head. 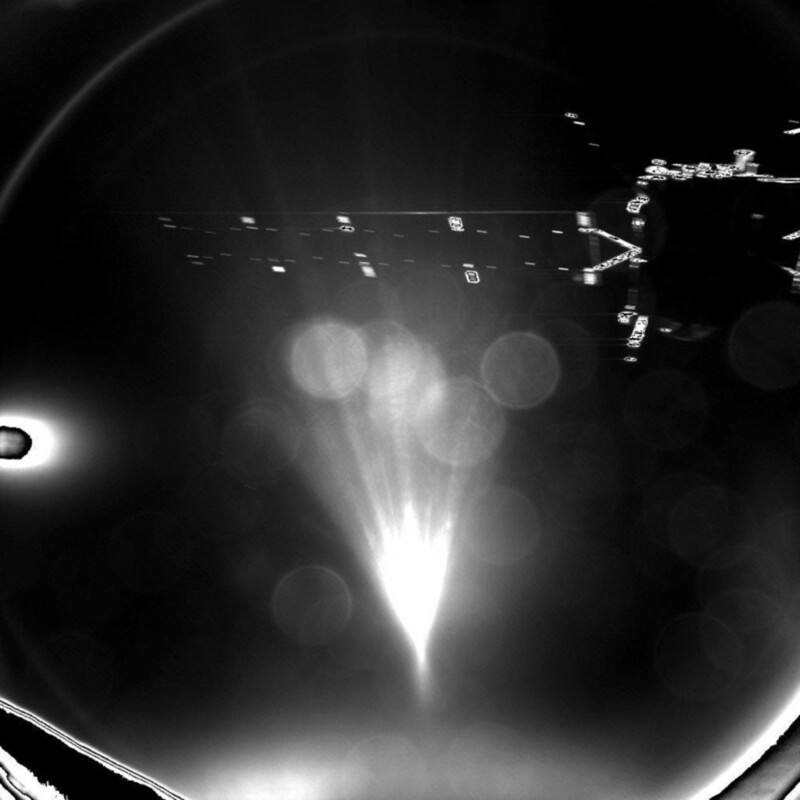 Only 1.5 hours of sunlight would reach the probe during the 12.4 hour long day of Rosetta. On top of that, Philae would be unable to deploy its drill, which would have given scientists insight into the composition of the comet. Battery life was down to 60 hours, then revised to 57. Suddenly, the entire mission went from a wild success to possible unfilled dreams (Timmer “Philae on Comet,” ESA “Rosetta’s Philae Probe,” Horowitz, Timmer “Philae 1 km,” Hutchinson, Talcott 45)). Time was critical, and scientists needed to figure out which instruments were going to be used and what would be sidelined. 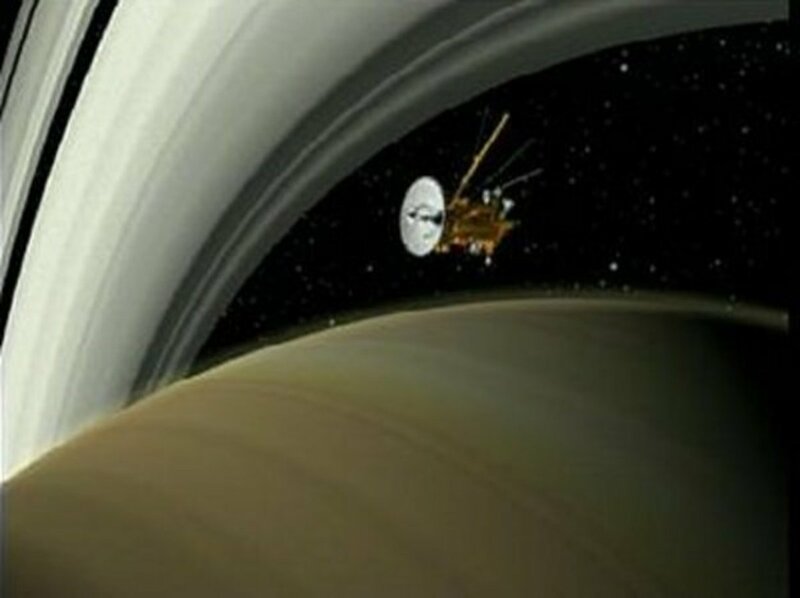 APXS and MUPUS were given the green light while the drill was saved as the absolute last thing to attempt after the probe was tilted 35 degrees in an effort to gather more light. And after 57 hours went by (3 less than expected), Philae automatically went into hibernation mode, awaiting sunlight to charge her back to life. Scientists felt that 80-90% of the intended science for that round was indeed accomplished (Schroeder, Ferron, Talcott 45). Scientific Insights, or Where Is the Water? What awaited scientists now was the interpretation of the data they did receive while Rosetta entered a 18 mile, then 11.6, then 6.1 mile orbits, followed by a 4 mile orbit for pictorial closeups. 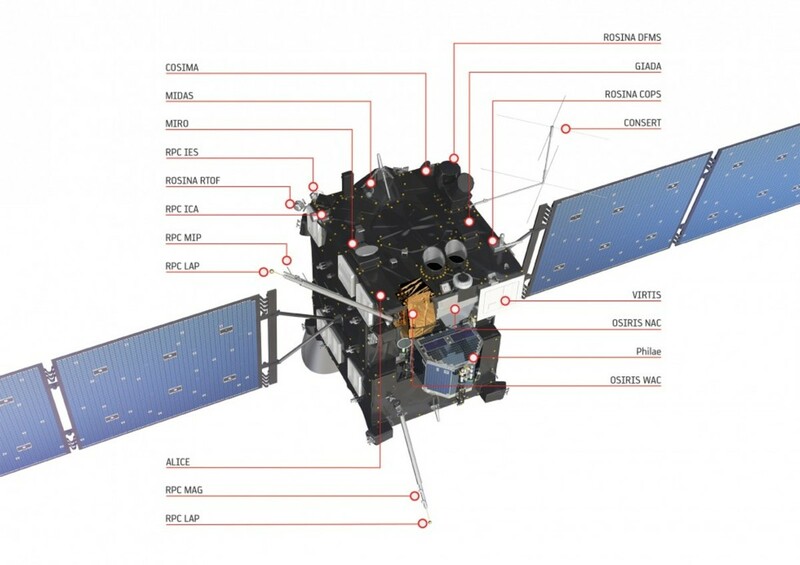 The MUPUS instrument was able to determine that the surface of 67P was harder than anticipated, almost like ice, after having difficulty breaking up layered material. SESAME seemed to back this view of the surface up after taking sound readings of the interior (DLR “Rosetta’s Philae,” Talcott 46). As Rosetta woke up and approached 67P, pictures began to hint at an interesting shape, almost like it were either two objects close together or a compacted object that was a result of a merger or sublimation of surface material. Further observations seem to confirm this, but what about water readings? A study led by Maria Christina De Sanctis (from the Italian National Institute of Astrophysics) looked at IR radiation in the hopes of seeing water ice. Why? Because that portion of the spectrum absorbs light rather well and thus an absence can be seen as a signature. Such changes were seen as the comet rotated from shadow to sunlight. In addition to that data, MIRO found signs that 67P was possible spitting out almost 300 milliliters of water a second. Further findings published in a September 23, 2015 issue of Nature showed a water cycle occurring in the Hapi region, near the neck. According to MIRO and ALICE readings, water ice along with dry ice would sublimate from the surface during the day as a photon hits an H2O molecule, splitting it and letting a spare electron collide with carbon dioxide ice. Then the heat from the surface would cause subsurface ice to melt to the surface where it froze and began the cycle again. Temperature readings of 67P from VIRTIS taken roughly the same time as all of this, from 8,700 to 3,100 miles away found that the comet underwent color changes as temperature changed and that the surface was -70 degrees Celsius. At that moment, 67P was over 3 AU away from the Sun and therefore should have been cooler if the surface was covered in ice (in fact, 20-30 degrees cooler). 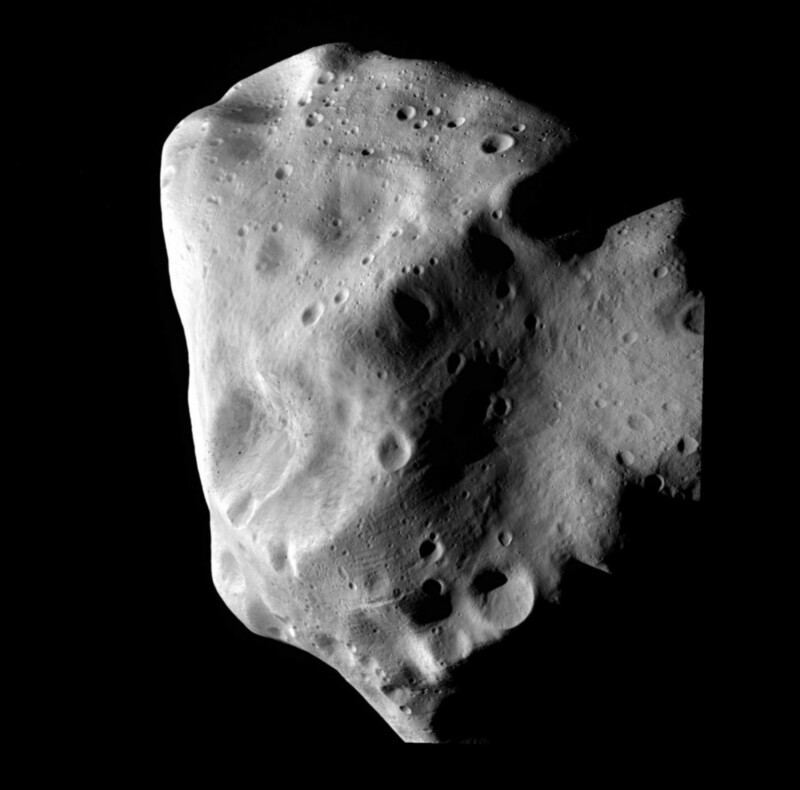 Instead, it hinted at a surface made of dust, similar to many other comets seen before. Visual readings pointed to a surface that only reflects 6% of the light that hits it and IR indicates a change of as much as 15% in reflectivity. Further spectroscopic readings did point to a carbon/ice mix and a dust grain composite, similar to what the early solar system had (AP, ESA “Rosetta Takes,” ESA “Rosetta Arrives,” Haynes Jan. 2016, Talcott 47-8, Johnson, ESA "Reveals"). The origination of water on Earth seems more likely to be mainly sourced from asteroids after deuterium levels were analyzed. This heavy form of hydrogen is a great gauge for finding water sources because as you go further from the Sun the levels present increase. Our levels match more with asteroids but some comets seems to be closer, but not 67P. ROSINA was able to find that 67P has deuterium levels 3 times those seen on Earth, a huge blow for those in the comet camp. In fact, it’s one of the highest levels ever seen, beating a majority Oort Cloud objects as well (Timmer “Early Rosetta,” Freeman, ESA “Rosetta Fuels,” Haynes Apr. 2015). Though water on Earth likely has a mixed origin, finding where the water vapor seen in 67P's atmosphere was challenging. Surely it was from sublimated water ice as the solar wind hit the surface, but where was the visual evidence for the water ice? Earlier in the article, the use of IR was discussed, but more evidence is always better. Sure, models predict a majority is under the crust, but scientists using VIRTIS found that in certain places the crust is a mix of many materials - including water ice. Images taken from September to November of 2014 showed the ice was about 5% of the crust at those regions and was at a temperature of -184 degrees Fahrenheit. And in some regions (like the Hapi) the ice mix can be in small pieces just a few millimeters across while in other places it could be as small as a few micrometers. These pieces could result from sublimation or from mergers with each other. Another possiblity is that they were released by comet activity but lacked sufficient mass/speed to escape the surface and so fell back down, now totally exposed. A total of 120 regions with water ice were spotted with a brightness of 10 times that of the surrounding surface (ESA "Rosetta Team," ESA "Exposed"). After much visual data was rolled in, the dimensions of the comet were better understood. 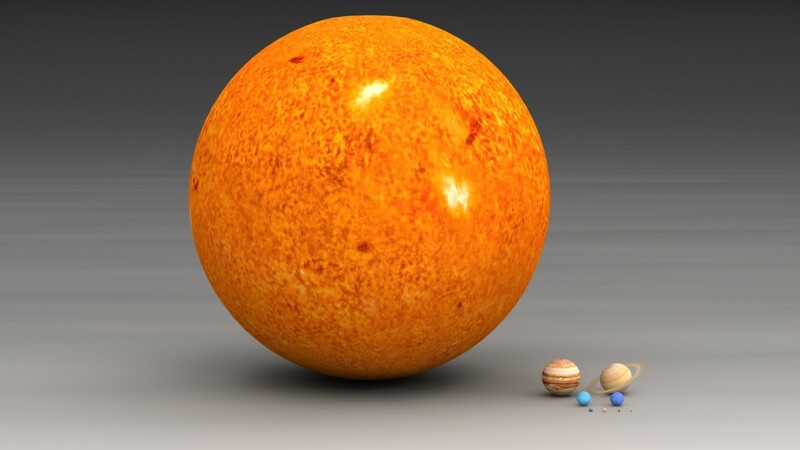 The small lobe is a 1.6 by 1.4 by 1.1 mile (2.6 by 2.3 by 1.8 kilometer) sized object while the larger one is 2.5 by 2 by 1.1 mile (4.1 by 3.3 by 1.8 kilometer) sized. This give a total volume of 5.1 cubic miles, which when interpreted with mass readings from RSI of 10 billion tons (9.1 trillion kilograms) gives a density of 29 pounds per cubic foot (or 470 kilograms per cubic meter). Based on the ice readings seen thus far when coupled with the density and radar bounces from CONSERT, it would seem that 67P is about 70-80 percent dust-ice mix with many pockets of air inside it. Lots of pits around the northern hemisphere with dust covering their perimeter seem to hint at this according to OSIRIS, with gases underneath releasing dust that falls back to the comet. They act similar to sinkholes seen on Earth, with the released gases creating cavities that the dust fills in (ESA “Getting to Know,” Thompson, University of Maryland, Talcott 47, ESA "Philae Lander," Haynes Nov. 2015). In fact, enough dust falls back to the surface to create dunes in certain places. The gases and solar wind dynamic cause a flow pattern that strongly resembles features seen on Earth. Based on the shape of the dunes on 67P and comparison with those on Earth, it seems as though dust covers the surface a few meters deep. This large layer may actually have some insulating properties, for MIRO compared places with dust to none and saw a large temperature differential (Ibid). And some of that dust actually ends up orbiting 67P. 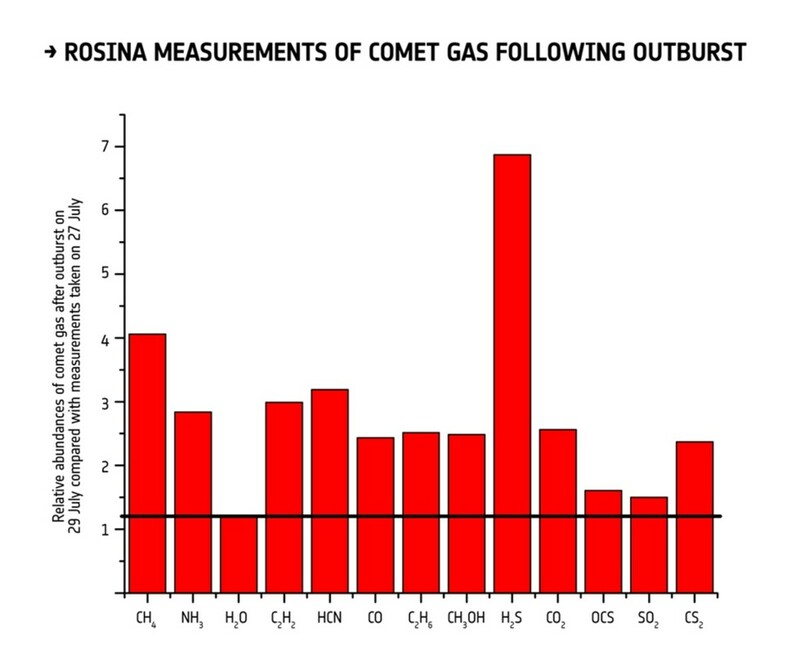 Data from MIRO, ROSINA, OSIRIS, and GIADA show that while some dust is leaving the comet, another set of dust is orbiting to within 80 miles (130 kilometers) of the comet. This actually goofed up the star tracker on Rosetta and forced it to enter safe mode! 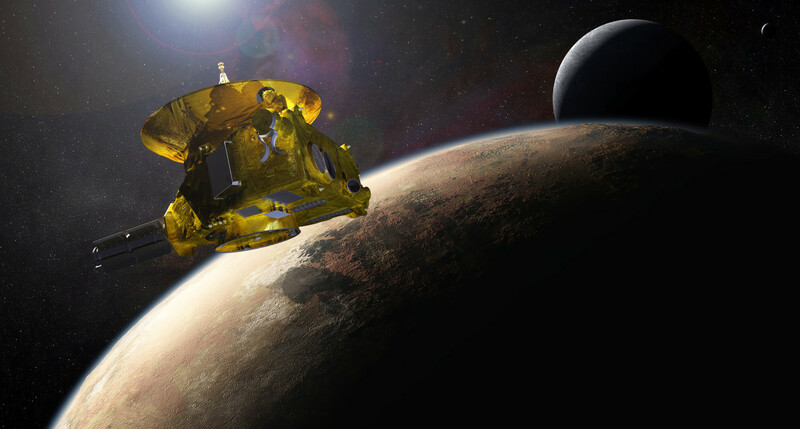 But fortunately the probe was brought back up within 24 hours and the probe was raised to a higher orbit, where it began to look into the nature of the dust. As solar activity increases, this population of dust starts to wane away until it is no more, but it returns once the comet passes perihelion and thus solar activity goes down. 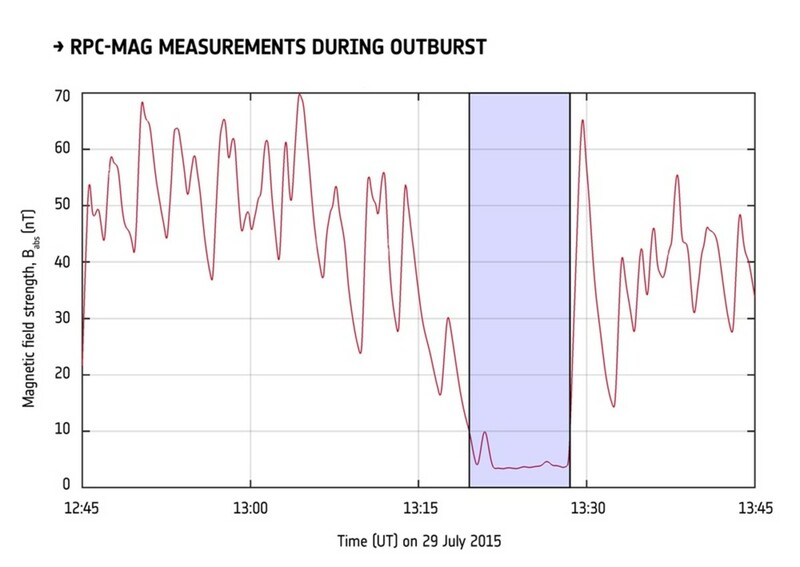 One thing that does not affect the dust is a magnetic field because 67P lacks an internal one, according to the ROMAP and CONSERT instruments. What does generate a field though is interactions of the solar wind with the surface. This finding was surprising because scientists suspected that magnetic field helped proto solar system objects cling together, for most are made of iron. Clearly, something else was at play (ESA “Getting to Know,” ESA “Rosetta and Philae,” Talcott 47). Further observations from COSIMA revealed a bit about the actually dust itself. Its aerogel collector looked at dust that hit Rosetta while moving at 2.2-22 mph (1-10 meters per second), and a majority either broke apart or hinted at wanting to. This tells us several things: that the dust is not structurally sound and that if ice were present in the small particles (usually about 0.05 millimeters in size) then they would be strong enough to retain their shape. It is likely that the ice melts not too long after the dust leaves the surface of the comet. But sodium was detected, a common element seen on other dust from other comets as well as a highly porous nature. This points to a long-term acclimation of interstellar and local dust which is shed as the comet approaches the Sun (ESA “Rosetta Watches,” Rzetelny). June 13, 2015 would prove to be a big day for the Rosetta mission when Philae phoned home after a 7 month hibernation in -240 degree Fahrenheit conditions. 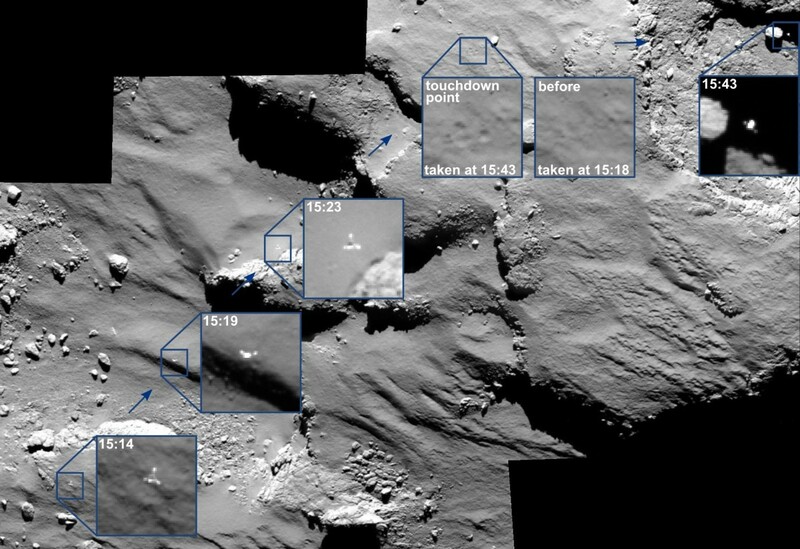 Data collected by the Cometary Sampling and Composition Gas Analyzer from 30 minutes after Philae's final landing showed a total of 16 organics present on the comet, with 4 never before seen on a comet before. The main elements seem to be carbon and nitrogen but the Ptolemy instrument saw water vapor, CO2, and carbon monoxide in the coma as well as formaldehyde, a major component of ribose and RNA aka life materials. And those bounces that Philae had undergone? Turns out they benefited us because we were able to compare different sections of the comet's surface and find more of these chemicals. In fact, it showed that the first landing site was harder than expected, possibly tripping the sensors. Sadly, Philae stopped transmitting on July 15, 2015 and scientists stopped trying to contact it in June of 2016. It would not be until September of 2016 that Philae was finally spotted in its little hiding spot, just like scientists suspected, but upside down and with only 1 leg touching the surface (Talcott 46, Betz "Ingredients," ESA "Philae Lander," Hrala, BEC Crew). As 67P approached perihelion on August 13, 2015, scientists were eagerly awaiting the change in behavior for the comet. As usual, the solar wind excites the surface enough to cause ice to sublimate and release a gas and dust trail. But on July 29, a huge outburst from the Anuket region (around the neck) recorded by OSIRIS reached as far as 116 miles above its surface and changed not only the shape of the coma but it also affected the magnetic field generated by the solar wind hitting the surface. The field was deflected away from the nucleus for a few minutes before returning to normal. The material from the outburst had been moving as fast as 33 feet per second upward and ROSINA saw that such a spread impacted the composition of the surrounding area. CO2 levels doubled, methane quadrupled, and hydrogen sulphide sextupled while hydrogen levels remained unchanged, indicating that the outburst was mainly dust. This theory was further boosted when the GIADA instrument found dust hits to be roughly 30 a day, way up from the 1-3 that it had been seeing earlier in the month. 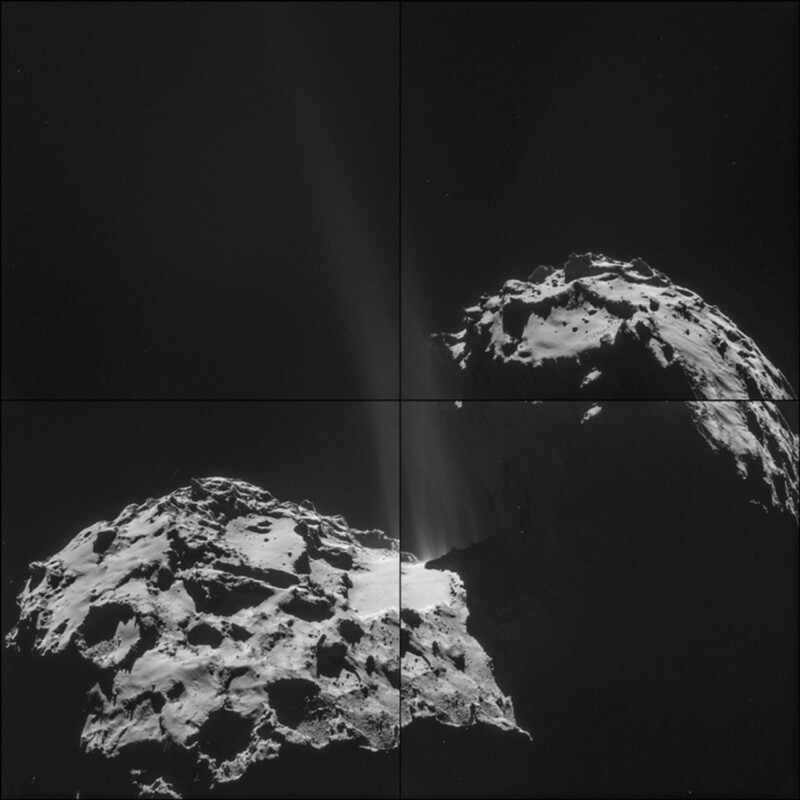 August 1 even saw a peak of 70 hits (ESA "Rosetta Sees"). Later that year, scientists released findings that showed molecular oxygen was found by the ROSINA instrument not only on the surface but also in the coma around the comet. In the October 15, 2015 issue of Nature, scientists remarked on how amazing the finding was because it is so reactive to...everything. Especially all the hydrogen that bombards it from the sun. Scientists from the University of Bern also remarked on the oxygen seen in the atmosphere, where its spectral lines were hidden between sulfur and methanol. When they looked at the abundances of all the gases seen in the coma, oxygen was in fact ranked 4th most common with water, CO,and CO2 being the most. 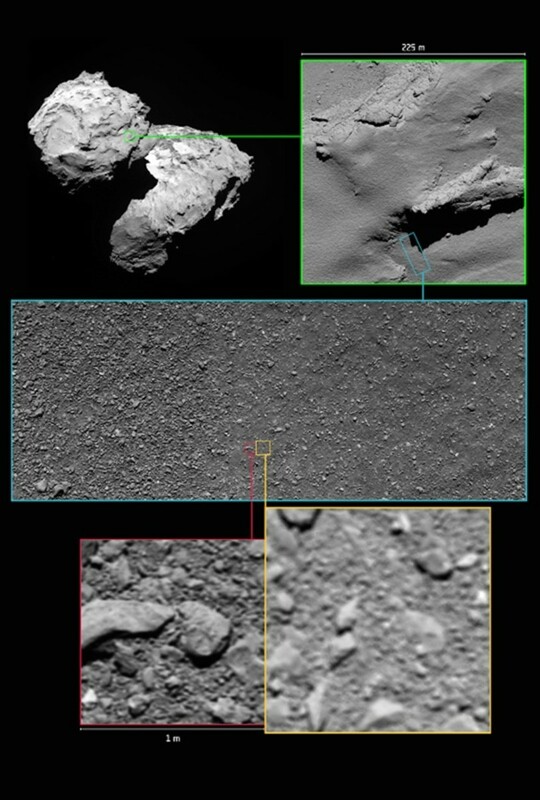 But based off these readings as well as other chemical clues, scientists found that the two lobes are very similar in make-up, implying an early solar system formation (for the components that make up 67P would have been close together and more likely to be similar in composition) that also resolves the oxygen dilemma. It would have its source at that time frame, where energy levels were high enough to prevent the oxygen and hydrogen from fusing into water, but once solar wind bombards the surface of the comet it does merge and thus explain the water levels levels seen. 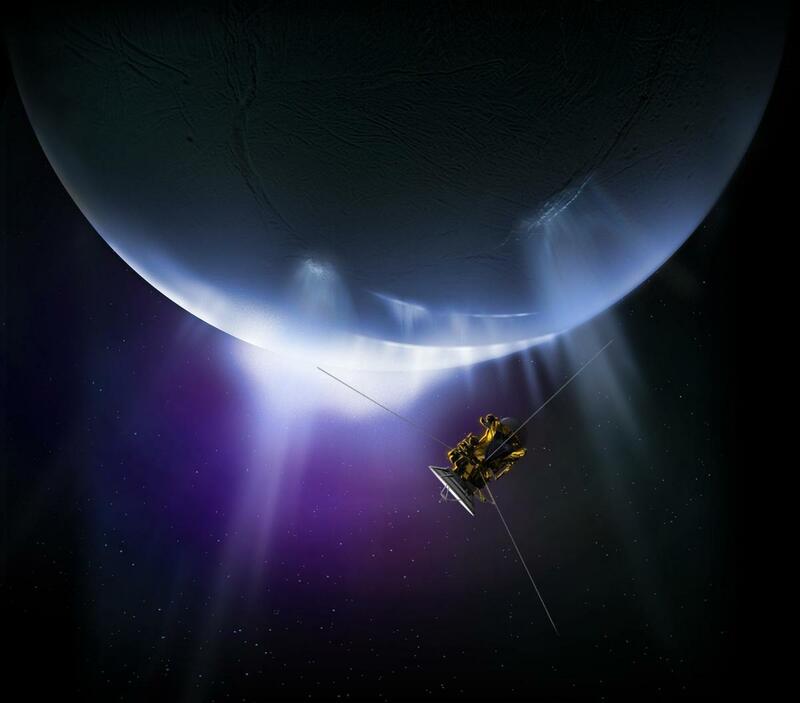 Some of the oxygen seen in the atmosphere does come from this source, but most seems to arise from chemical processes involving the ultraviolet sunlight hitting compounds around the comet, according to work from Konstantinos Giapis and Yunxi Yao (Betz "How," University of Bern, Klesman). On February 19, 2016 67P roared with a violent outburst from its surface, located in the Atum region began as that part of the comet entered daylight and surface ices began to sublimate. Over a 2 hour period, the UV radiation coming off the comet's nucleus went up by a factor of six and the dust being ejected increased as well. How much so? Well, most days prior to that averaged 3-10 particle hits but during the outburst the number was almost 200! And the temperature of the gas surrounding the comet increased by 30 degrees Celsius (Wall). All good science missions must come to a close, and Rosetta was no different. On September 29, 2016 the probe fired its engines for 208 seconds on a course to the surface of 67P and on the 30th impact occurred and all communications with the probe were lost. Moving in at 90cm/second, the probe continued to collect data right down to the end, pursuing it's mission for as long as possible (Berger). AP. 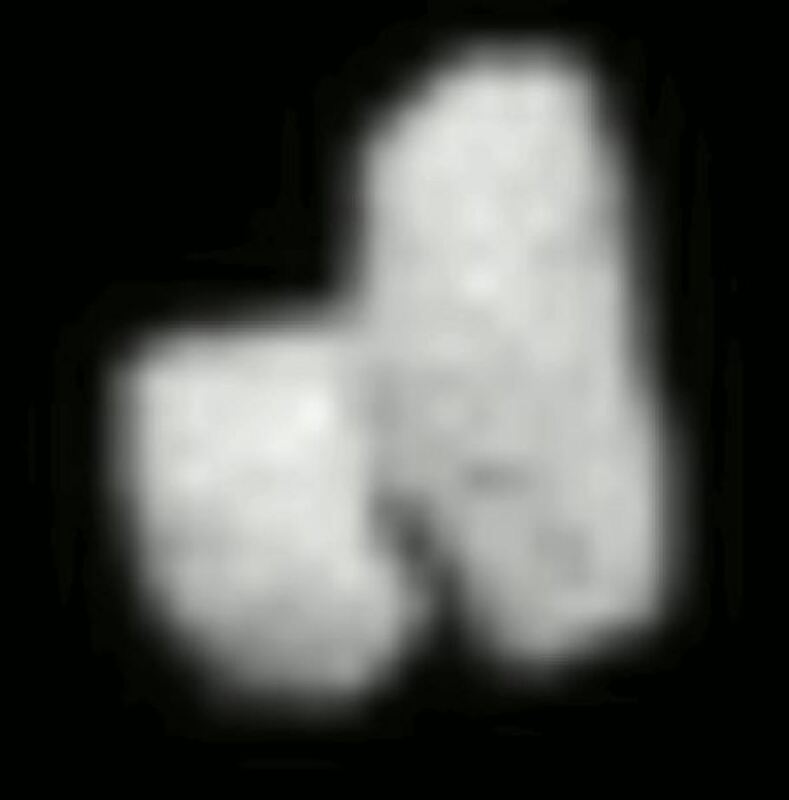 “Comet-Chasing Probe Reveals Space Rock’s Strange Shape.” HuffingtonPost.com. Huffington Post, 17 Jul. 2014. Web. 28 Dec. 2015. BEC Crew. 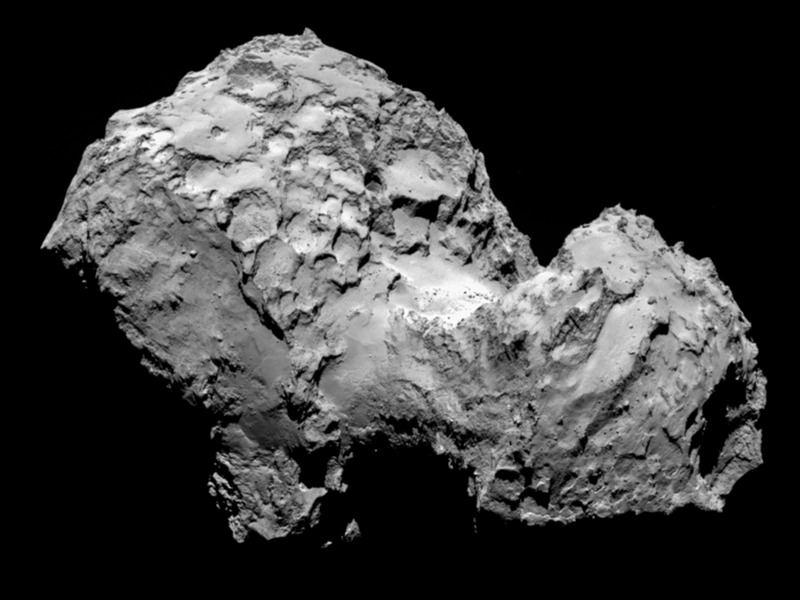 "Guys, We Finally Found Philae - And It's Crammed Inside a Comet." sciencealert.com Science Alert, 06 Sept. 2016. Web. 19 Oct 2016. Berger, Eric. "Rosetta Finished Slow Descent to Comet's Surface Friday Morning." arstechnica.com. Conte Nast., 30 Sept. 2016. Web. 19 Oct. 2016. Betz, Eric. "How the Rubber Ducky Took Shape." Astronomy Feb. 2016: 18. Print. ---. "Ingredients for Life on 67P." 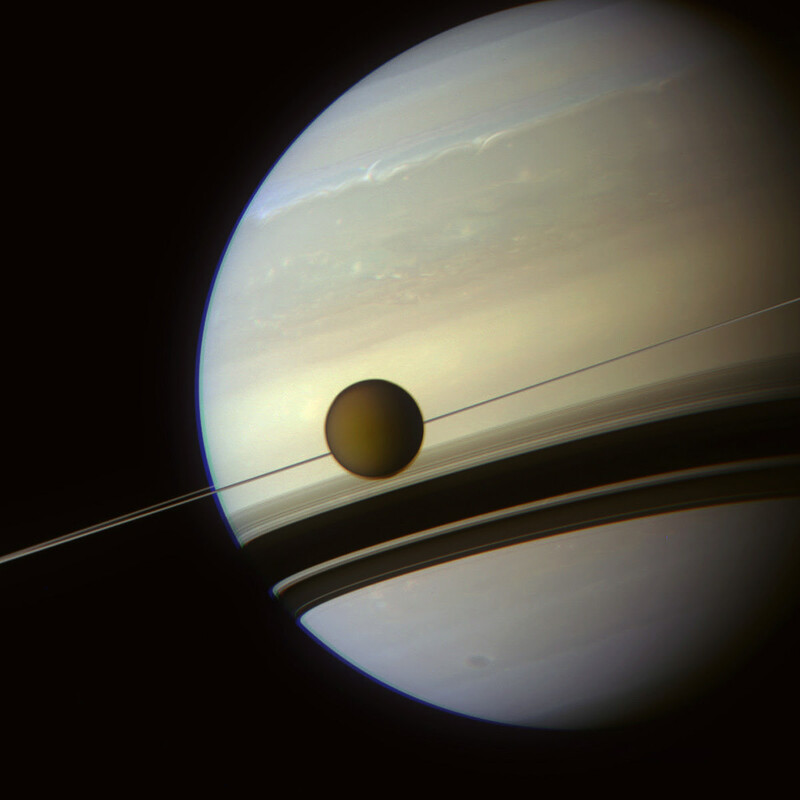 Astronomy Nov. 2015: 12. Print. DLR. 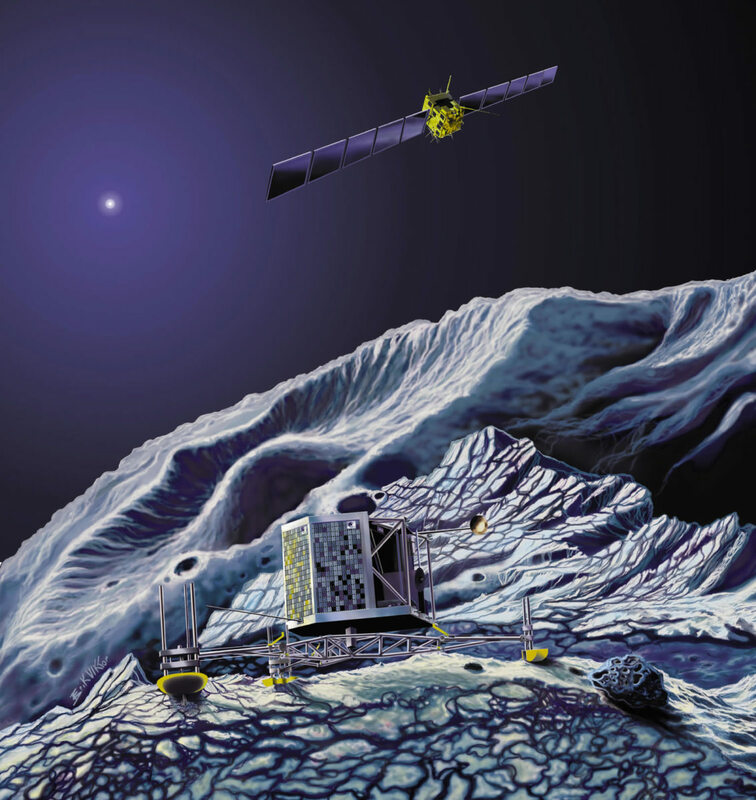 “Rosetta’s Philae Finds Hard Ice and Organic Molecules.” Astronomy.com. Kalmbach Publishing Co., 18 Nov. 2014. Web. 06 Feb. 2016. ESA. 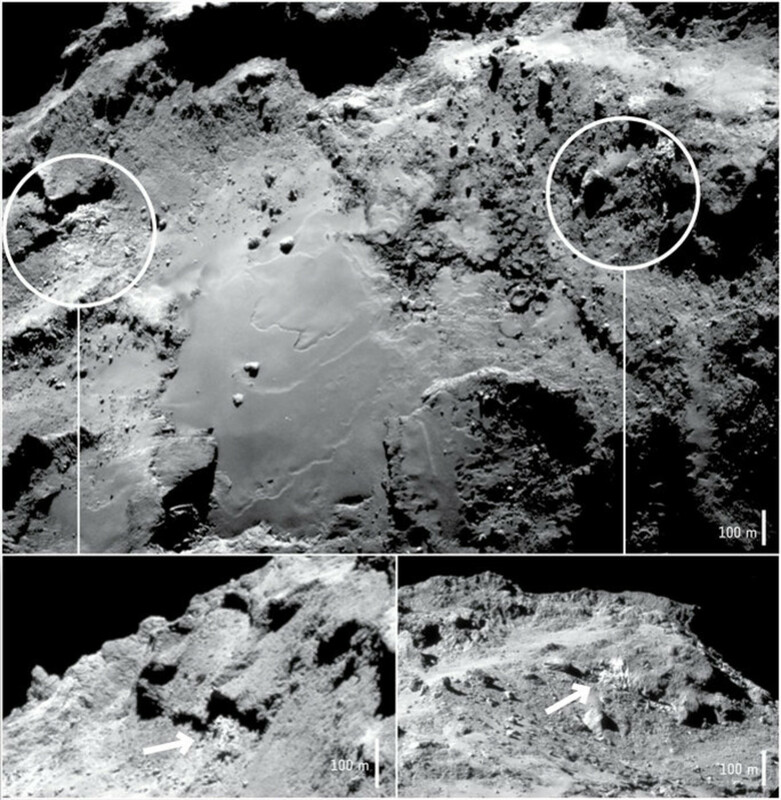 "Exposed Water Ice Detected on Rosetta Comet's Surface." Astronomy.com. Kalmbach Publishing Co., 30 Jun. 2015. Web. 18 Oct. 2017. ---. “Getting to Know Rosetta’s Comet.” Astronomy.com. Kalmbach Publishing Co., 22 Jan. 2015. Web. 07 Feb. 2016. ---. "Philae Lander Finds Ingredients For Life." Astronomy.com. Kalmbach Publishing Co., 31 Jul. 2015. Web. 17 Jul. 2016. ---. “Rosetta and Philae Find Comet Not Magnetized.” Astronomy.com. Kalmbach Publishing Co., 15 Apr. 2015. Web. 11 Feb. 2016. ---. “Rosetta Arrives at Comet Destination.” Astronomy.com. Kalmbach Publishing Co., 06 Aug. 2014. Web. 30 Dec. 2015. ---. “Rosetta Fuels Debate on Origin of Earth’s Oceans.” Astronomy.com. Kalmbach Publishing Co., 11 Dec. 2014. Web. 06 Feb. 2016. ---. “Rosetta’s Philae Probe Lands on Comet.” Astronomy.com. Kalmbach Publishing Co., 12 Nov. 2014. Web. 03 Jan. 2016. ---. 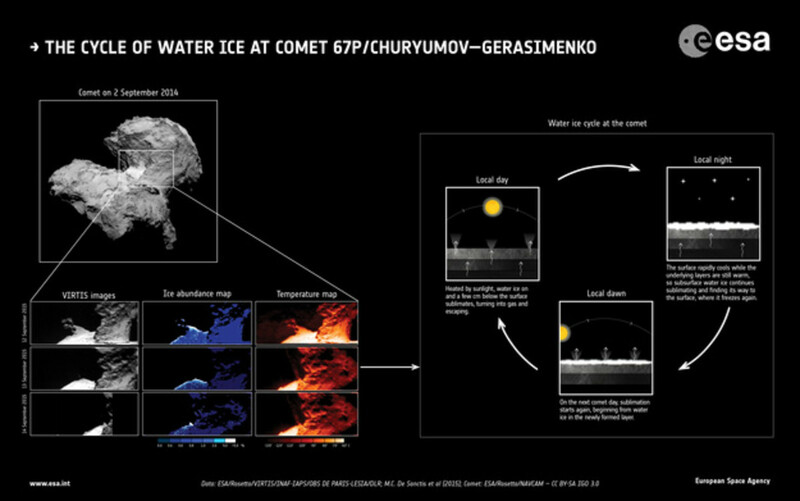 "Rosetta Reveals Comet's Water-Ice Cycle." Astronomy.com. Kalmbach Publishing Co., 24 Sept. 2015. Web. 18 Jul. 2016. ---. "Rosetta Sees Comet's Fireworks Display Ahead of Perihelion." Astronomy.com. Kalmbach Publishing Co., 11 Aug. 2015. Web. 17 Jul 2016. ---. “Rosetta Takes Comet’s Temperature.” Astronomy.com. Kalmbach Publishing Co., 05 Aug. 2014. Web. 30 Dec. 2015. ---. 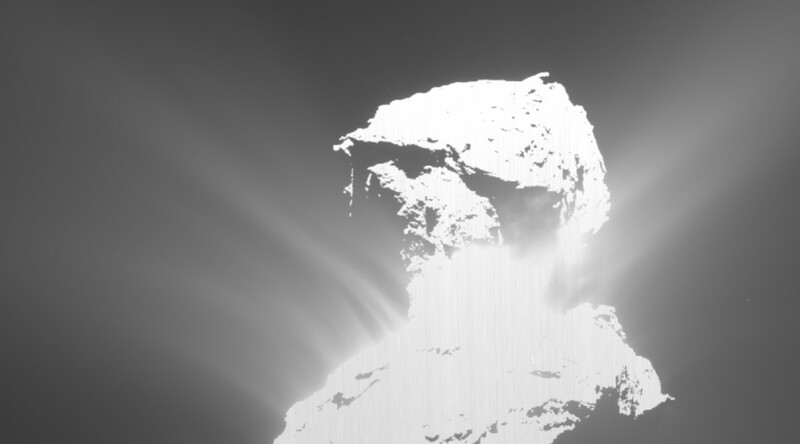 "Rosetta Team Confirms Water Ice on Comet 67P's Surface." Astronomy.com. Kalmbach Publishing Co., 14 Jan. 2016. Web. 19 Jul. 2016. ---. “Rosetta Watches Comet Shed Its Dusty Coat.” Astronomy.com. Kalmbach Publishing Co., 26 Jan. 2015. Web. 09 Feb. 2016. Ferron, Karri. “Philae Continues to Work as Battery Power Dwindles.” Astronomy.com. Kalmbach Publishing Co., 14 Nov. 2014. Web. 28 Jan. 2016. Freeman, David. 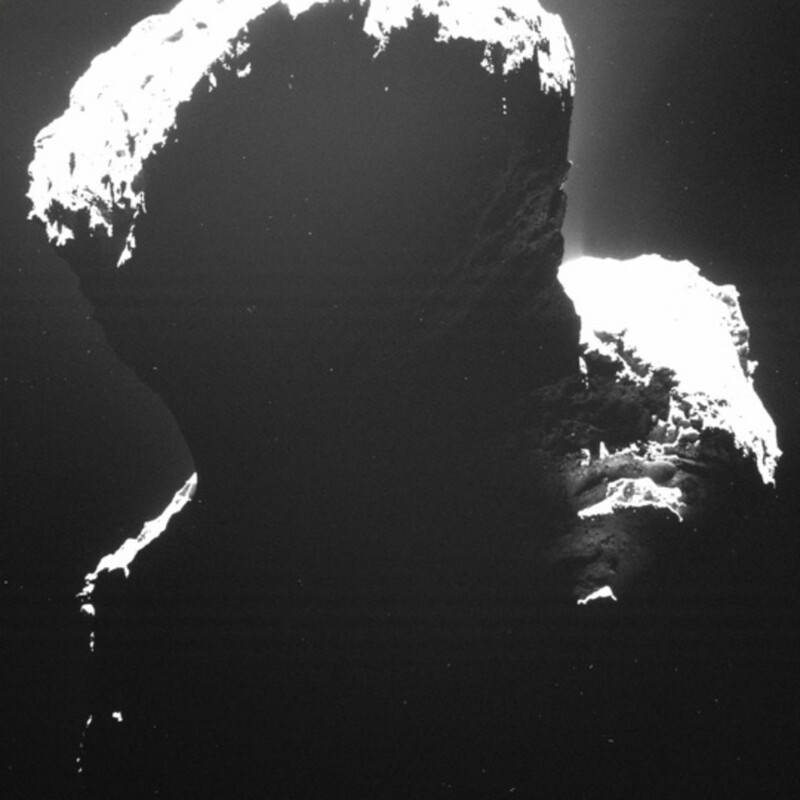 “Rosetta Data Suggests Earth’s Water Didn’t Come From Comets After All.” Huffingtonpst.com. Huffington Post, 10 Dec. 2014. Web. 06 Feb. 2016. Haynes, Korey. "Rosetta Refreshes Debate on Earth's Water." Astronomy Apr. 2015: 13. Print. ---. "Rosetta Spies Sinkhole on a Comet." 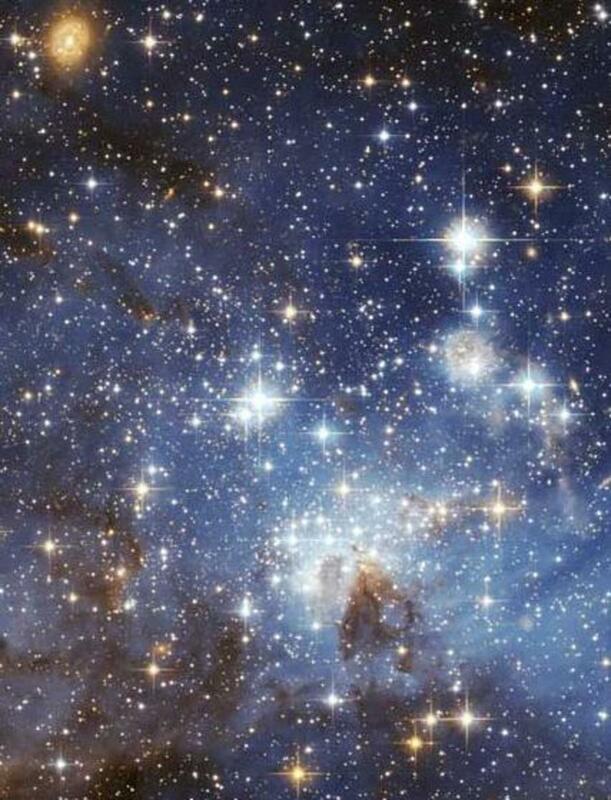 Astronomy Nov. 2015: 15. Print. ---. "Rosetta Spies Water Cycle on 67P." Astronomy Jan. 2016: 12. Print. Heinemann, Erik. 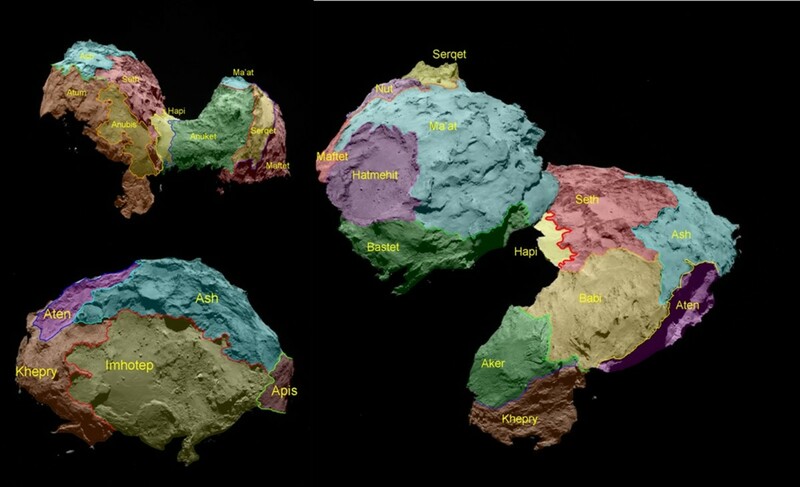 “Rosetta at a Glance.” DLR.de. DLR, 12 Oct. 2013. Web. 26 Dec. 2015. Horowitz, Alana. “Rosetta’s Spacecraft Successfully Lands on Comet.” HuffingtonPost.com. Huffington Post, 12 Nov. 2014. Web. 20 Jan. 2016. Hrala, Josh. "It’s time for us to say goodbye to the Philae lander." sciencealert.com. Science Alert, 12 Feb. 2016. Web. 20 Jul. 2016. Hutchinson, Lee. 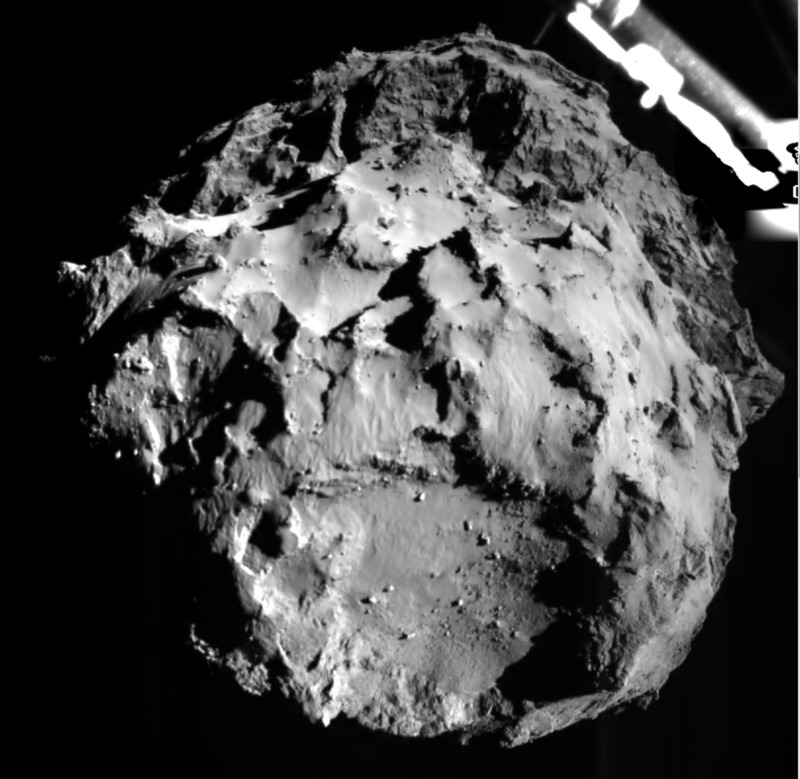 “High-Res Rosetta Pics Catch Little Philae Lander Bouncing Across Comet.” arstechnica.com. Conte Nast, 17 Nov. 2014. Web. 28 Jan. 2016. Johnson, Scott K. "Comet 67P Gets Frosty in the Shade." arstechnica.com. Conte Nast, 23 Sept. 2015. Web. 18 Jul. 2016. Klesman, Alison. 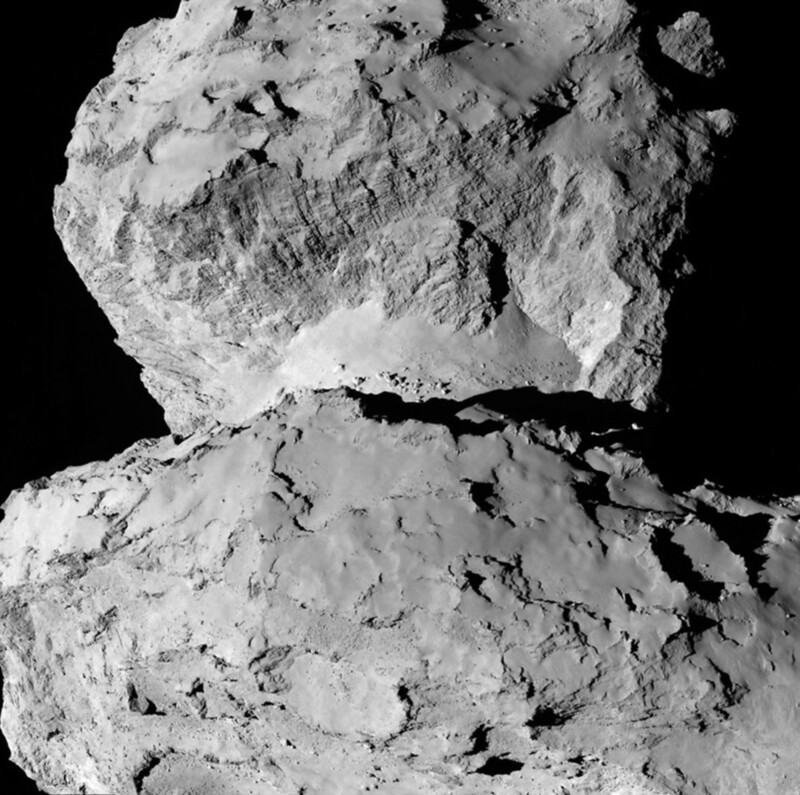 "Comet 67P is Making Its Own Oxygen Gas." Astronomy.com. Kalmbach Publishing Co., 09 May. 2017. Web. 07 Nov. 2017. Max Planck Institute. “Rosetta: The Dark Side of the Comet.” 07 Nov. 2014. Web. 01 Jan. 2016. NASA. 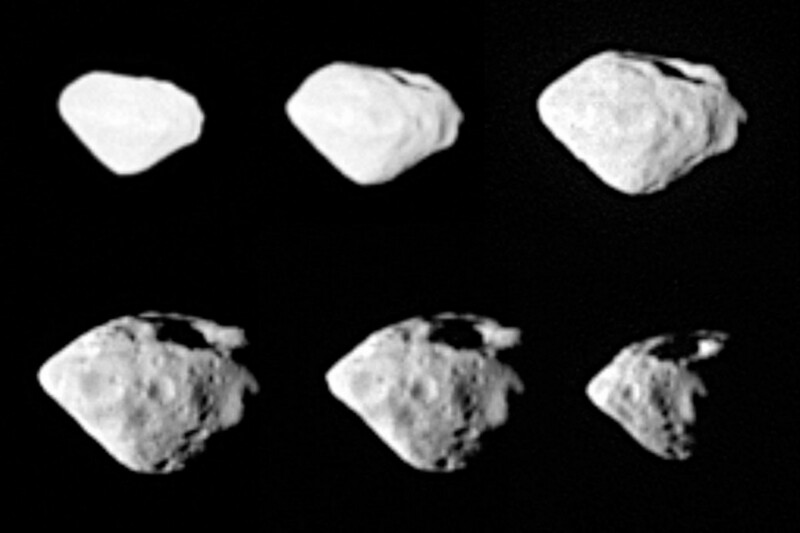 “As Seen by Rosetta: Comet Surface Variations.” Astronomy.com. Kalmbach Publishing Co., 18 Aug. 2014. Web. 31 Dec. 2015. Rzetelny, Xaq. “Rosetta Spacecraft Catches Pieces as Comet Sheds its Dusty Crust.” arstechnica.com Conte Nast., 29 Jan. 2015. Web. 09 Feb. 2016. Schroeder, Christian. “Doing Science With Philae’s Limited Power Budget.” arstechnica.com. Conte Nast, 14 Nov. 2014. Web. 24 Jan. 2016. Talcott, Richard. "Rendezvous With An Evolving Comet." 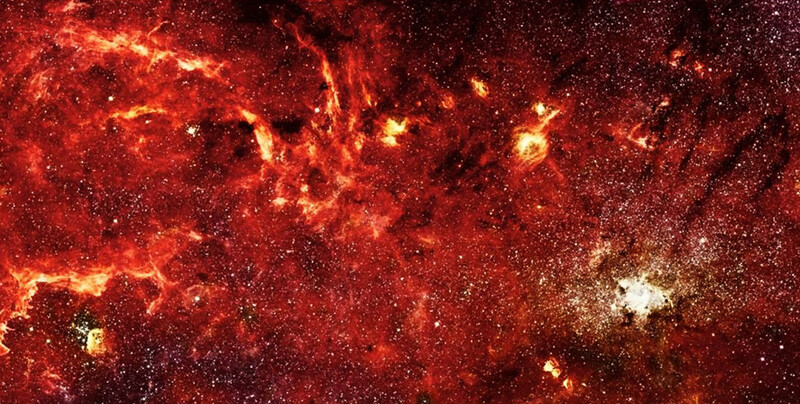 Astronomy Sept. 2015: 45-8. Print. Timmer, John. “Early Rosetta Data Causes Rethink of Where Earth Got Its Water.” arstechnica.com. Conte Nast., 10 Dec. 2014. Web. 06 Feb. 2016. ---. “Philae 1 km From Original Landing Site, Exact Location Unknown.” arstechnica.com. Conte Nast., 13 Nov. 2014. Web. 22 Jan. 2016. ---. “Philae on Comet, But Not Secured.” arstechnica.com. Conte Nast., 12 Nov. 2014. Web. 03 Jan. 2016. Thompson, Amy. “Rosetta Spots Sinkholes, Hints of Interior Caverns on Comet” arstechnica.com. Conte Nast., 01 Jul. 2015. Web. 11 Feb. 2016. University of Bern. "Surprising Discovery of Oxygen in Comet 67P's Atmosphere." Astronomy.com. Kalmbach Publishing Co., 28 Oct. 2015. Web. 19 Jul. 2016. University of Maryland. “Rosetta Spacecraft Sees Sinkholes on Comet. Astrononomy.com. Kalmbach Publishing Co., 02 Jul. 2015. Web. 11 Feb. 2016. Wall, Mike. "Rosetta Dazzled by Spectacular Comet Eruption." seeker.com. Discovery Communications, 26 Aug. 2016. Web. 19 Oct. 2016.